Journalism most foul, he said. I have given Sunday’s article by Steve Mallia some more thought. Here’s his Facebook post yesterday night saying he was moved to come out of retirement to write it. Here he is being complemented by his former colleague at The Sunday Times and his current business partner in the PR business they have together Ariadne Massa. Ariadne Massa is director of ‘Media Insiders’, a PR agency, Steve Mallia is Communications Strategist for. Ariadne Massa says Steve Mallia is warning against the “threat of activist-journalists”. And here’s his other former colleague Mark Micallef giving him the thumbs up. 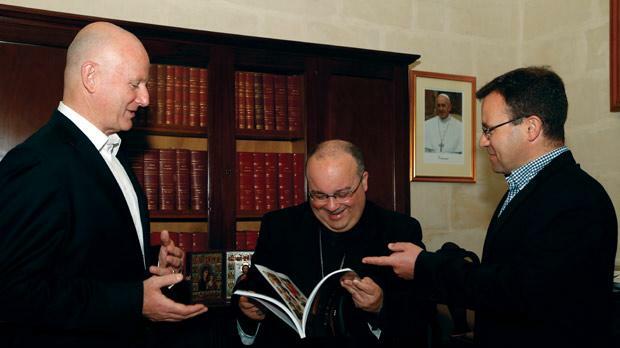 And then Saviour Balzan, the unlikeliest of sources, congratulated Steve Mallia on his article. I can’t link his tweet because I’m blocked from his account. For some reason. When you see this you realise we’re dealing with a hatchet job here. First let’s deal with the argument in Steve Mallia’s article which reduced to its bare bones is this: Manuel Delia is not a journalist. He’s really an activist in a midway transition of a political career: the career in his past he is trying to make us forget, and the career in his future that will evolve from his pretence of being a journalist. He does not name me. And a number of the characteristics he indicates can also be applied to Caroline Muscat of The Shift News. She was briefly employed by the PN some years ago and her reporting on The Shift News is unambiguously supportive of the effort to seek the truth and justice surrounding the life, work and death of Daphne Caruana Galizia. Therefore to a lesser or greater extent Caroline Muscat and myself are held up for the target practice of Steve Mallia and the others who came out to applaud him. 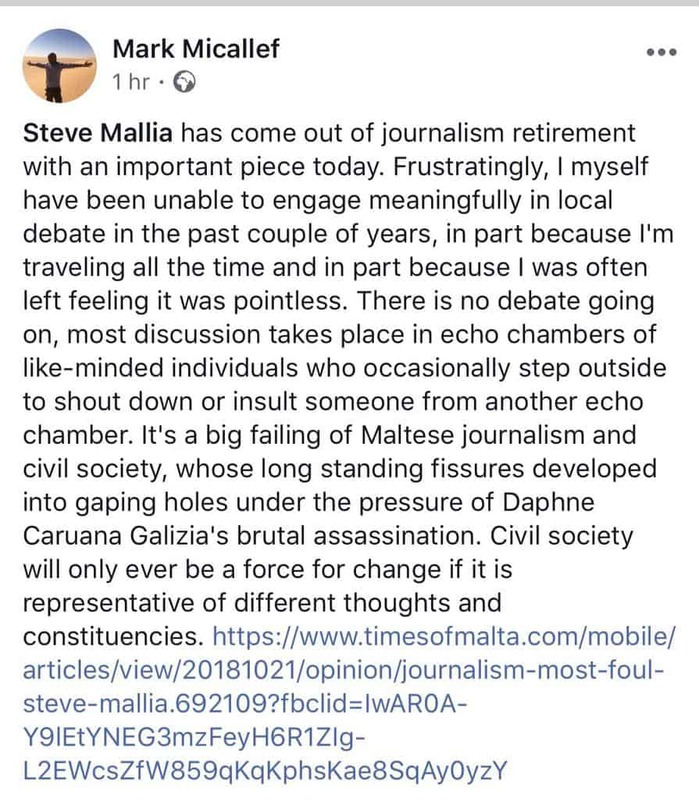 My first reaction is to the stunning fact that Steve Mallia felt moved by the threat to journalism that I pose to come out of retirement and write about it but did not feel moved by the threat posed by the car explosion that killed Daphne Caruana Galizia to come out of retirement and write about that. This is even more stunning considering he chose the first Sunday after the anniversary from that event to pointedly ignore the murder of a journalist and instead criticise the supposed threat to his former profession that Caroline Muscat and myself pose. The same can be said for the stooges who stepped out to applaud him. Steve Mallia is wrong. I make no effort to cancel my past. I did not transition from politics to journalism as a result of some great stratagem. I left politics in 2013 when I failed to get elected and the party I campaigned with and had worked for lost the election. For four and half years I traded metals and sold software in Zimbabwe, Nigeria, Indonesia, China and other places and had no intention of returning to anything related to politics. I blogged from June 2017 as an amateur in my free time and had no pretence of being a journalist. Then Daphne Caruana Galizia was killed and unlike Steve Mallia that single event moved me to come out of my retirement. Unlike Steve Mallia I left my secure employment that paid me about five times what I manage to string together from donations now and did and do my very best to provide my readers with a service. Therefore in my case the journalism is actually a consequence of the activism. Now let’s speak about Steve Mallia’s own past that he too tried to convince his readers did not exist. Steve Mallia was editor of The Sunday Times. When he stepped into the position he sat at the most prestigious and respected desk in Maltese journalism. He inherited a reputation of impartiality and independence of decades. And he squandered it. I never wrote about his years as editor before today and that is not because I do not have an opinion. It is because up to 2013 I was part of the government his job was to criticise and keep in check. I never wanted to accuse a journalist of being selective or partial in order to create some form of apology for my own shortcomings. As such I always found it conflicting to use journalism, even my own blog, to try to craft my own version of events when I was in politics and he in journalism. But after 2013 I was called to answer for my time in politics. There I was in Parliament, under oath, answering the penetrating questions of Owen Bonnici and Edward Zammit Lewis who acquitted me of any hint of wrongdoing in the corruption scandal in oil procurement that the Ministry I worked in was responsible for. That scandal was uncovered by Saviour Balzan of MaltaToday, and a public service he did in doing so too. Thanks to that journalistic work, people are being prosecuted for corruption. But it has been established by a Parliamentary investigation that no corruption in that scandal reached any political level, including me. Not the same can be said of Steve Mallia. It wasn’t someone that reported to Steve Mallia while editor of The Sunday Times that was caught taking bribes. It was his boss to whom Steve Mallia reported. The Adrian Hillman scandal happened under Steve Mallia’s nose. He had to consciously and actively ignore it in order not to notice it. Adrian Hillman, as far as we know, pocketed €650,000 from Keith Schembri. We do not know whether Steve Mallia was also on the take. But we know that Steve Mallia took direction from Adrian Hillman about the content of his newspaper. He will vehemently deny this no doubt. I would imagine he has already done so replying to the internal inquiry, never published, conducted by The Times when the story broke about the rot within its ranks. But Steve Mallia will not be able to deny Adrian Hillman’s notorious and frequent presence in the newsroom. Was he in a position to know what Adrian Hillman and Keith Schembri were up to? Yes. Did he know? Only he knows that. But if he didn’t, perhaps he needs to reassess his own recollections of his journalism. Like the rest of the country Steve Mallia was best placed to be surprised at the direction the newspaper was taken. Better than any of us he knew about the Saturday nights when the front page would be held back for a story to be fed in the last minute without time for fact checking but with plenty of time to damage the PN administration of the time. Steve Mallia could see better than anyone, and everyone was seeing how the historic adherence to truth and fact-based journalism of the newspapers controlled by Adrian Hillman, and through him Keith Schembri, was being thrown out of the window. Steve Mallia could see better than anyone that financially The Times had become an item on Keith Schembri’s balance sheet. That it had become so enthralled to him financially, even discounting the bribes he paid its Managing Director, that any hint of objectivity was no longer possible. Keith Schembri supplied The Times with paper and the equipment to print on it. They owed him more than they could pay and he liked it just that way. Steve Mallia could see better than anyone that Keith Schembri would explicitly communicate displeasure through Adrian Hillman at any stories that did not serve Keith Schembri’s interests. Steve Mallia could see as anyone else at The Times celebrations at the newspaper offices after the March 2013 election result, when Tagħna Lkoll became a motto of that newspaper as much as it had become the motto of any other media institution Keith Schembri had colonised. After struggling with his conscience what did Steve Mallia do? He left The Times and sought greener pastures. 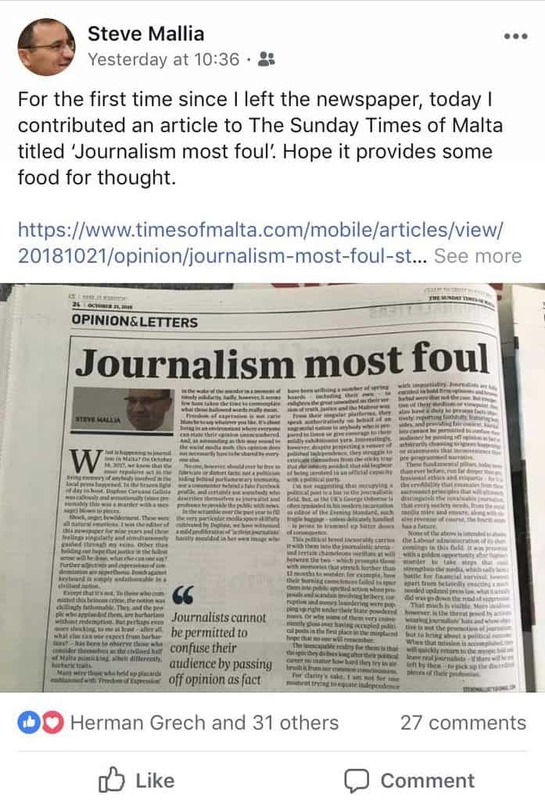 Though he was in a position to know what Keith Schembri and Adrian Hillman had done, he issued no warnings then about ‘journalism most foul’. He was careful to avoid burning bridges as he would now transition from journalism to being a publicist, making bad people look good against payment. If Steve Mallia had been a bit more of an activist as well as a journalist he would have taken the principled view and outed the corruption at the organisation he worked for — The Times — not covered it up with his complicity at first and silence eventually. In sum therefore as I see it, I have no corruption in my past and no hypocrisy in my present. Steve Mallia is the opposite of that. Steve Mallia’s article warns ‘real’ journalists that after I move away from journalism on to my imaginary second chapter in a political career, I will leave them a legacy they need to be concerned about. Perhaps. But I assure Steve Mallia many ‘real’ journalists today still reflect on the legacy he left them when he walked away from journalism. The reputation of Malta’s newspaper of record in tatters, embarrassingly having to hide corruption in its own ranks while its job is to discover corruption in others. No one will ever forget the response Keith Schembri gave Panama Papers and The Times journalist Jacob Borg when the latter chased the former up Merchants Street asking him to explain moneys he was not supposed to be in possession of. Keith Schembri told him ‘I used them to pay your salary the last three years’. There very openly we could see that Keith Schembri was still seeking to cash on the Faustian pact signed with him when Steve Mallia was the editor of The Sunday Times. Speaking for myself I would say Steve Mallia knows enough about the political game that if I truly aspired for a political comeback I am now going about it the wrong way altogether. Attributing this idea to Caroline Muscat is perhaps even more ridiculous. But she’s a big girl and she can speak for herself. I am not building bridges for a political career. I am burning them by seeking the truth wherever and by whomever it is hidden. Steve Mallia and Ariadne Massa instead send bills to people whom they advise on the use of tricks of manipulation of information, a skill they have acquired over many years of a pretence of impartiality. No, Steve Mallia, I am clearly not impartial. I think John Sweeney said it best when he wondered how someone like you would report Germany’s invasion of Poland in 1939. Would you have reported without comment the German argument they invaded out of self-defence? You’d have been impartial but in being neutral between right and wrong you would have propped up the wrong. In between Daphne Caruana Galizia and those who killed her, I’m not neutral. I make that call. Journalistically speaking between a journalist that has been killed and a government that is covering up for those who commissioned her murder, not to mention those that in her life she revealed as corrupt and yet remain in office, I feel it is my responsibility to make the call and declare my bias on one side over the other. We all know, Steve Mallia, that faced by the allegations against Keith Schembri your line would have been impartial. And in that impartiality you would have protected the criminal. As you now, against payment or perhaps out of wilful enthusiasm to please those who are in a position to compensate you with their business, protect the criminals Caroline Muscat and I seek to journalistically indict. This is who you come out of your money-making retirement to protect. Satabank: And how I let them bully me into silence.